We hire out hay and straw bales, festoon lights and party props throughout Kent, to help you set a picture perfect scene for your event. Rustic wedding? 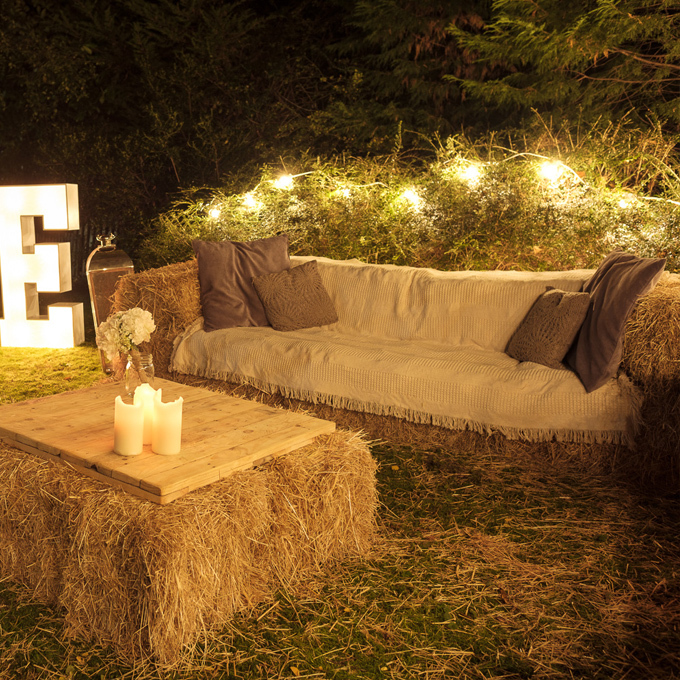 Style your perfect day with hay bale sofas made cosy with blankets and cushions, wooden tables bedecked with jars of flowers and later illuminate the night with our LOVE letters. Need a bar? We have barrels and crates to construct your perfect cocktail bar, glasses, tin bath beer coolers, Kilner jar drink dispensers plus a whole host of other props to get the party in full swing. Need to festoon your fete? 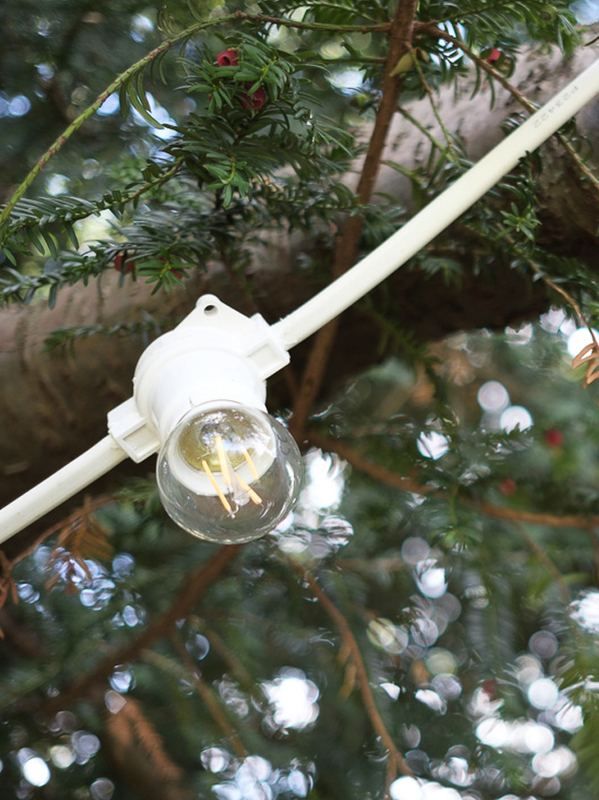 We have metres and metres of white festoon lights to put the festive in your festival. Paired with hay bale seats and beer barrel tables and you've got a fab fete. There's no ten week delivery on these sofas! One of our most popular party props, hay and straw bales are super strong, surprisingly comfortable and so easy and fast to set up. They make a stylishly rustic alternative to traditional seating options and provide a huge amount of flexible seating for large gatherings. Available in different configurations depending on your requirements, from love seats to large L-shapes. Drape with cosy blankets and cushions and you'll have every guest vying for top spot on the sofa! You can hire hay bale covers, blankets and cushions from us too. Individual hay bales are exceptionally versatile. You can use them as ceremony seating, or instead of chairs around tables, or as long benches at festivals. Use them here and there to help bring a rustic look to life - they make fab photo backdrops. They're also great for propping up wedding / party direction signs, or creating convenient little side tables for drinks and nibbles. They also look great stacked up to balance table tops for bars or buffets to sit on. One of our most popular props and one of our favourites! 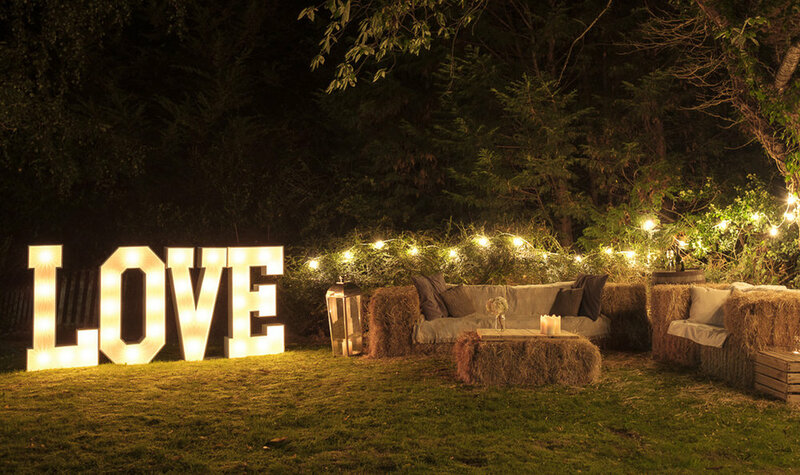 Wow your guests with these beautiful 4ft tall light up letters which come with LED lights. They’re free standing and create a fabulous backdrop especially for your photos. Designed for indoor use, but can be used outside on a dry day. They’re also surprisingly light and easy to move should it start to rain! You can have any letter combination you like. Popular choices are monogram initials, LOVE and MR & MRS. Each letter is 4ft high by 2ft wide. (120cm x 61cm). Our beautiful aged Oak Whiskey Barrels are another firm favourite and have so many uses. They can be used as part of a bar structure, forming the base whilst our weathered table tops sit neatly on them to create a rustic bar. Pair with our Rustic Apple Crates for added display height. This works equally well for a bar set up or for food. 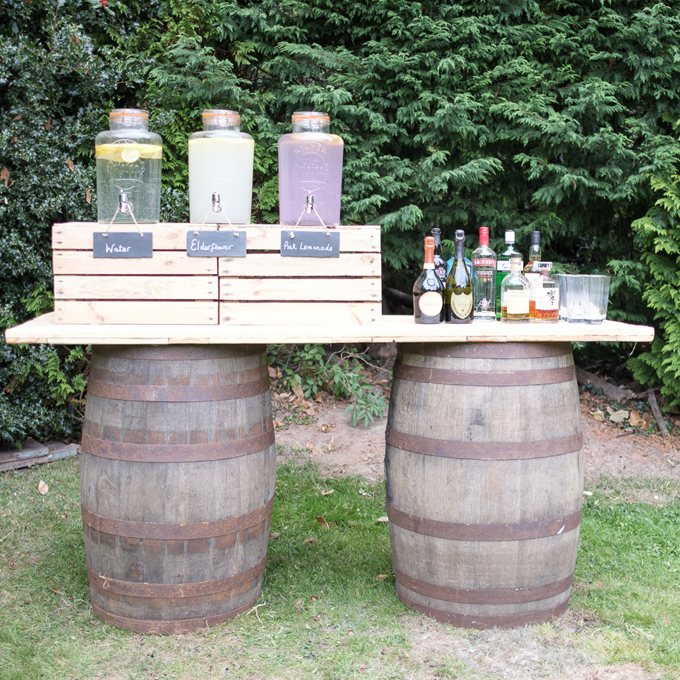 Suitable for indoor or outdoor use, individual barrels make superb standing tables to place drinks or canapés on. Barrels are 36” high x 28” wide at the belly (90cm x 70cm). Bar tops measure 6ft in length x 2 ft wide (183cm x 60cm). Use these handcrafted classic Kent apple crates to style your event. You won't find a more versatile party prop. Fill them with flip-flops for tired out dancing feet, or blankets to keep guests warm when there's a chill in the evening air. Use them to display flowers, or Orders of Ceremony, candles, cakes, party favours - you name it! Up-end them to use as tables or to add height to displays on bars, buffets and table centrepieces. Apple crates are approximately 19 ¾ “ long15 ¾” wide 12” high (50cm x 40cm x 30cm). 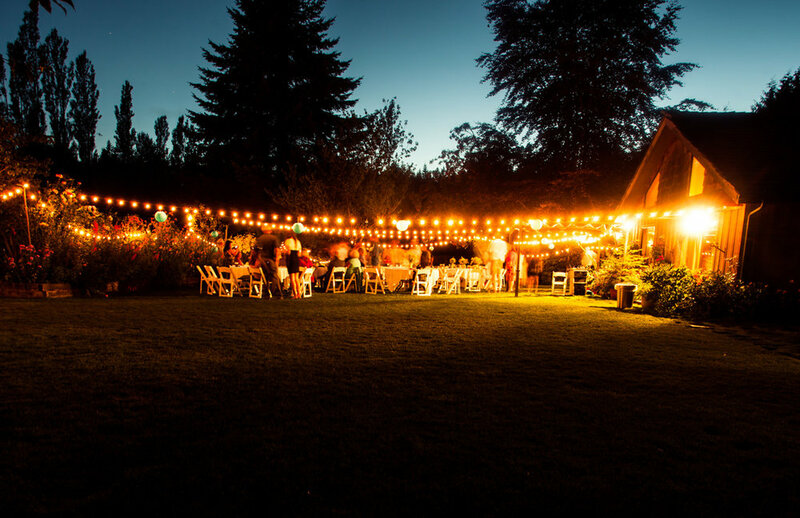 Nothing says party like festoon lights, and these ones are extra special. They have an IP54 rating which means they’re protected from water spray from any direction so you can use them safely outdoors as well as indoors, whatever the weather. They have a gorgeous warm white light and will make any occasion feel very special. We have a large supply of these available. We are able to supply the cable in white or black. It's always five o'clock somewhere! Expecting a crowd? 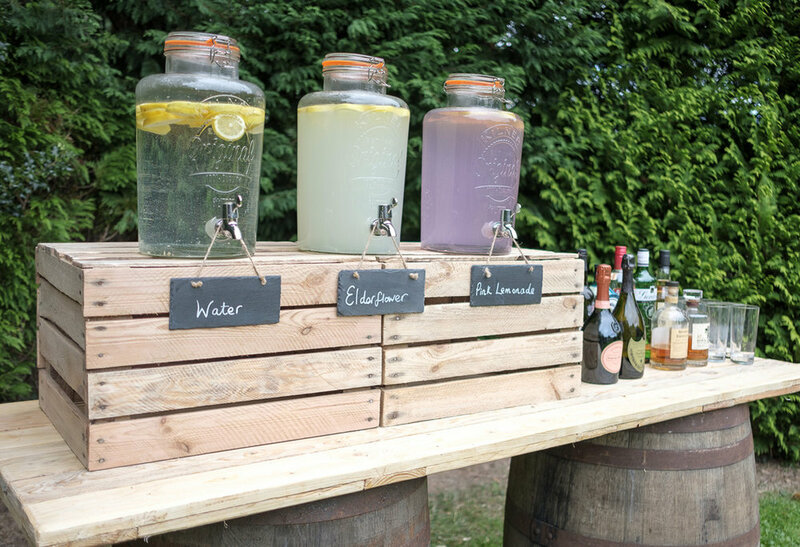 These retro inspired 8 litre Original Kilner Drink Dispensers will be your best hostessing friend as guests can help themselves to refreshments. 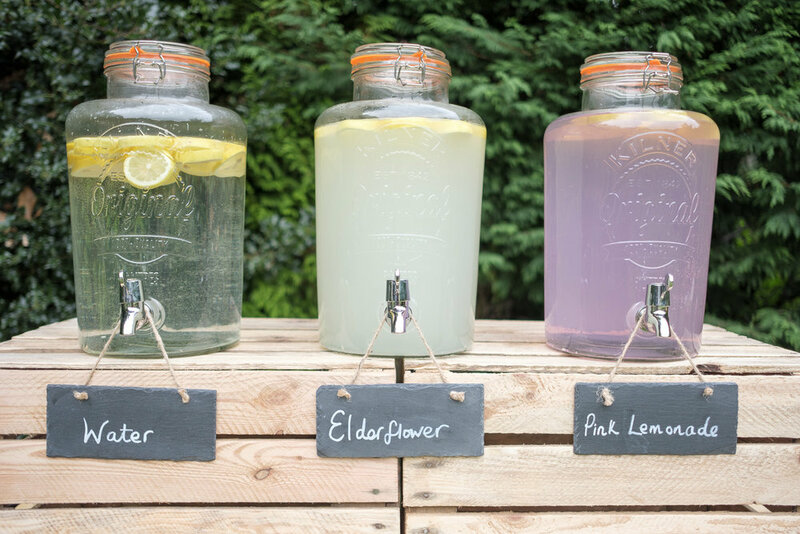 Include several dispensers on your bar so there's something for everyone - from homemade lemonade, to cocktails that pack a punch. Why not mix a signature cocktail just for the event? They look gorgeous and are fabulous for gatherings of any kind, no-one likes waiting for a drink! 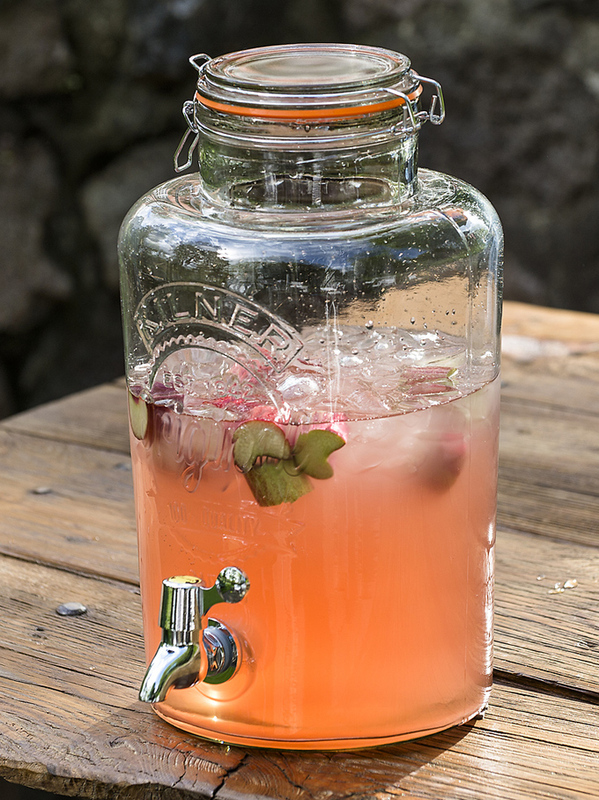 Kilner Glass Drink Dispensers are 12” tall x8 ¾” diameter (36cm x 22cm), 8L capacity. Stash your champagne, wines and beers on ice in these fabulous tin baths. They'll look great, stay chilled and guests can help themselves to a refill, keeping the party in full swing. We have two sizes - the traditional large bath tub - 36" long 20″ wide x 12″ high(90cm x 50cm x 30cm) and a smaller round tub. If you're hosting an event outdoors you may like to consider our high quality and virtually unbreakable plastic glasses which are almost indistinguishable from glass to prevent breakages from spoiling a special occasion. Available in four sizes - champagne, wine, pint and half pint. Flower or light filled jam jars will add to your event decor. The delightful jars can be filled with all manner of lovely things to add styling touches - Flowers, retro candy stripe straws for drinks, twinkling fairy lights or elegant tea light candles... the list goes on. Place on tables, hang in trees or you can hire our accompanying shepherds crooks. At 4ft (1.2metres) high, these crooks can be pushed into lawn / soft ground and are perfect for hanging lanterns or flower filled jars from.